Easily turn your USB or Firewire device into a bootable, diagnostics toolkit for Mac. You can take it with you. 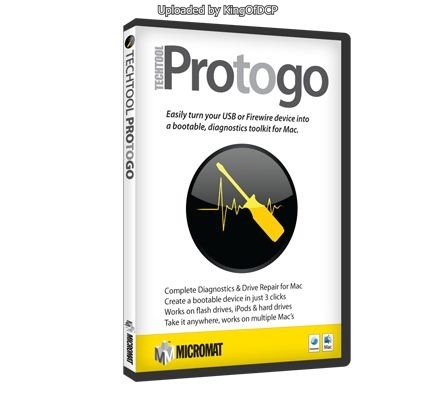 Using Protogo, you can easily turn a USB or FireWire device, such as an iPod, flash drive, compact hard drive, or SD Card, into a powerful toolkit to troubleshoot all of the Macs in your life. Now you can boot, run diagnostics and perform drive repair on multiple Macs, both Intel and PPC, from a single, portable device as small as a flash drive. Just drop it into your pocket, take it anywhere. How convenient. Plug and play redefined. Plug in a flash drive or retired iPod to help maintain or repair your Mac. With Protogo and just a few clicks, you can configure a bootable device to maintain and monitor your Macs for impending problems. You can create your own custom profiles too, and your device will run software faster than from a DVD. Once you see how well that works, youll protect all your Macs with Protogo. Its that easy. Powered by TechTool Pro. Your Protogo profiles include TechTool Pro to diagnose hardware issues, repair drives, fix disk permissions, clone volumes, backup your Lion Recovery HD to another Lion device, and a lot more. Plus you can add other utilities, like anti-virus, to complement your profiles and help you prevent costly repairs in the future. Whats more, you can reconfigure your device profiles anytime you need. Thats versatility.